Good music -- especially the C minor scherzo. 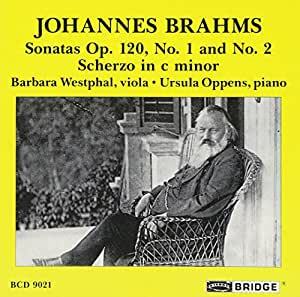 There are many sets of the Brahms Clarinet/Viola sonatas available out there right now, but this recording by Barbara Westphal and Ursula Oppens is a real sleeper hit. The playing is not in the least bit reticent, with Westphal displaying a full, rich sound, more in the tenore color than the alto school favored by Primrose. I especially enjoyed the partnership with Ursuala Oppens, who is a formidable pianist who is normally found in new music circles. She applies her fierce intellect to these often problematic piano parts (these are truly duo sonatas, both instruments play equal roles) and as a result, both players find much new to say in these performances. The FAE Scherzo transcription is a welcome bonus. I'd also advise afficianados of the Brahms Sonatas on Viola to seek out the Kim Kashkashian/Robert Levin set on ECM New Series, and the Veronika Hagen/Paul Gulda on Deutsche Grammophon. Happy Listening!